(Franck Polleux) High magnification confocal image of a E15 GFP expressing cortical neuron plated onto a cortical slice and cultured for 5 days in vitro. A double immunofluorescent labeling was performed against GFP (green) and MAP2 (red) which reveals the full dendritic arborization of the GFP neuron (yellow). Image acquired using a Zeiss LSM 510 confocal microscope. 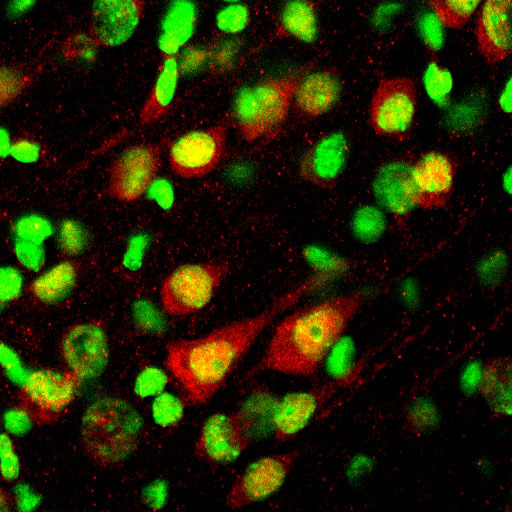 Immunofluorescent staining of the receptor Notch-1 (red) on frozen sections of the P14 rat cerebral cortex in vivo. Hoechst staining revealing cell nuclei has been pseudo-colored in green. 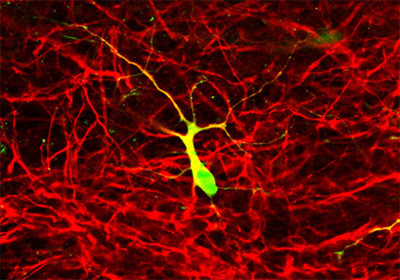 Notch 1 labels the cytoplasm (red) and the nuclei (yellow) of large pyramidal neurons found in layer 5. Image acquired using Zeiss LSM 510 confocal microscope. Low magnification micrograph of a slice overlay assay. 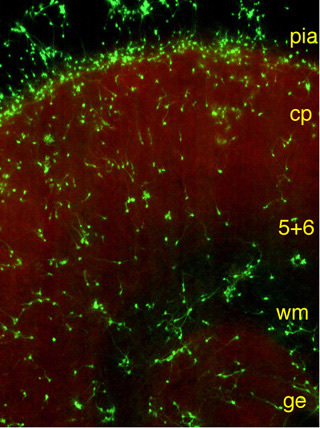 In this system E15 cortical neurons are isolated from transgenic mice (Okabe et al. 1997) which express the Green Fluorescent Protein (GFP) under the control of a ubiquitous promoter (beta-actin). The brain of these so-called 'green' mice represents a pure source of GFP expressing cells which are plated onto cortical slices (red - stained for the dendritic marker MAP2). This technique allows us to study the extracelluler factors which control neuronal differentiation. Abbreviations: cp, cortical plate; ge, ganglionic eminence; 5+6, layers 5 and 6; wm, white matter. Image acquired using a Nikon TE300 inverted microscope. 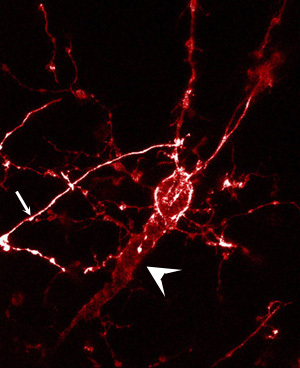 Abnormally oriented (inverted) pyramidal neuron found in layer 5 of a Sema3A (-/-) mouse cortex. This neuron presenting an abnormally oriented apical dendrite (directed towards the white matter instead of the pial surface; arrowhead) was labeled by an injection of DiI performed in the intermediate zone of an E20 mouse cortex where the SEMA3A gene has been genetically inactivated (see Polleux et al. 1998 for detail). This kind of anomaly of apical dendrite orientation is found significantly more often in the cortex of SEMA3A knockout mice then in the cortex of wild type mice. The arrow indicates the axon which initially grows towards the pial surface (top of the image) but perform a sharp turn and finally projects towards the white matter. 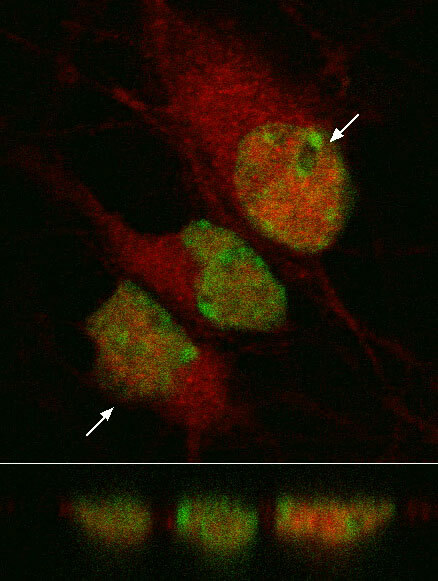 Immunofluorescent staining of the receptor Notch-1 (red) on E18 cortical neurons in dissociated in vitro culture. Hoechst staining revealing cell nuclei has been pseudo-colored in green. The bottom part represents an orthogonal scan through the three cells presented above at the level indicated by the two arrows. Image acquired using Zeiss LSM 410 confocal microscope.